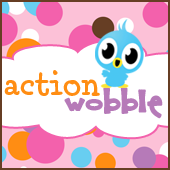 Action Wobbles: Out of this World!! This is Melissa with Moe Creations, I hope your having a wonderful day?!? I have a little card to share with you today, using an Action Wobble of course! The little space ship is a sticker from the dollar tree! The sentiment is from Cardz TV Stamps! Holy smokes, this is absolutely adorable!! !